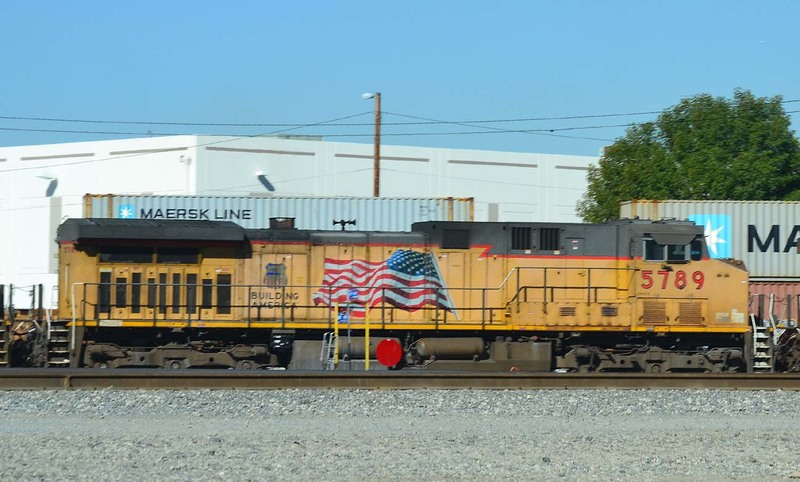 As with all the remaining Class 1 railroads, Union Pacific has become a major purchaser of locomotives from General Electric, especially since 1995. UP was an early user of the Dash-8 series as well, including the standard-cab versions, which it picked up in the 1980s. They have continued buying from GE, buying every model in the catalogue including quite a few of the convertible AC60/44 type. More recently UP has continued to upgrade with whatever model of GEVO power was current. 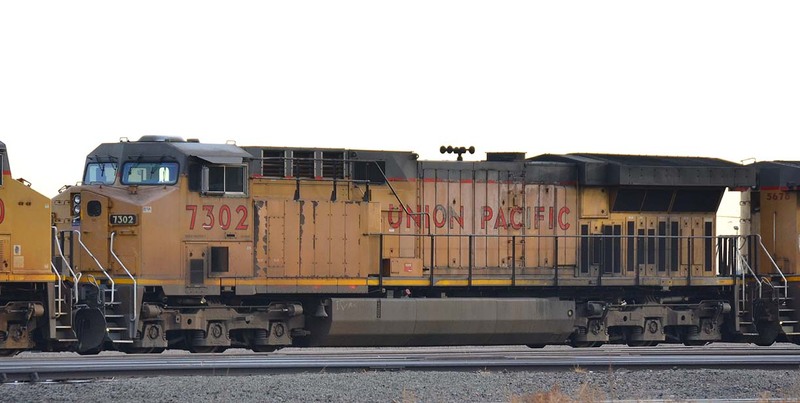 This page has a selection of GE locomotives rostered by UP, including a few that it absorbed via merger. B40-8 No. 1880, in Houston on 10/17/2007. This was originally SSW No. 8083, delivered May 1989 and painted yellow ten years later as No. 5689. It received this number in February 2004. C40-8 No. 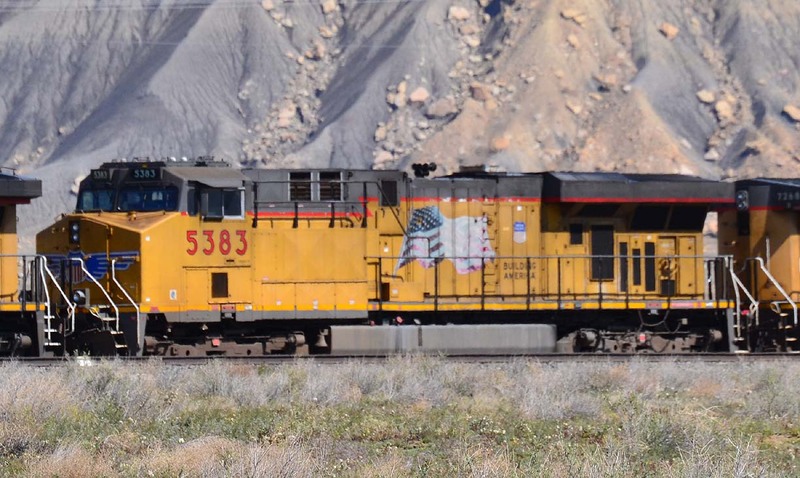 9331, in Helper, UT with sister 9343. This unit was received in 1989, part of the same order as No. 9151 above. 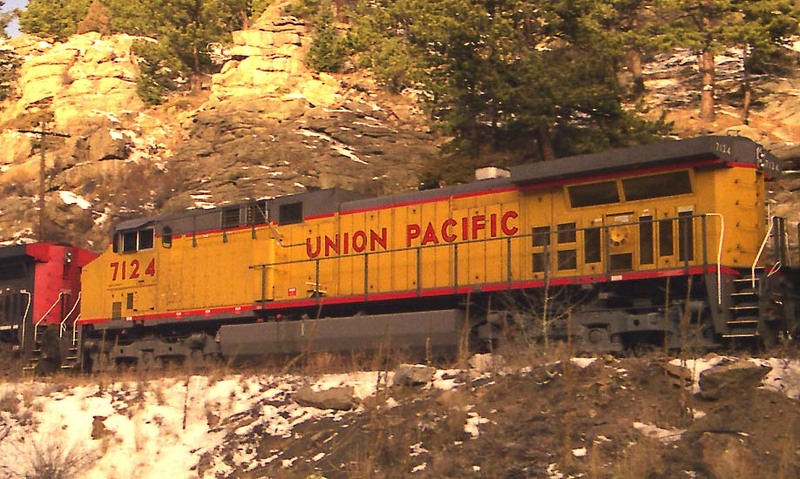 The C40-8 is a DC-traction, standard-cab locomotive– some of the last ordered by UP (or any railroad) so configured. Wide cabs became the norm in the early 1990’s. C40-8 No. 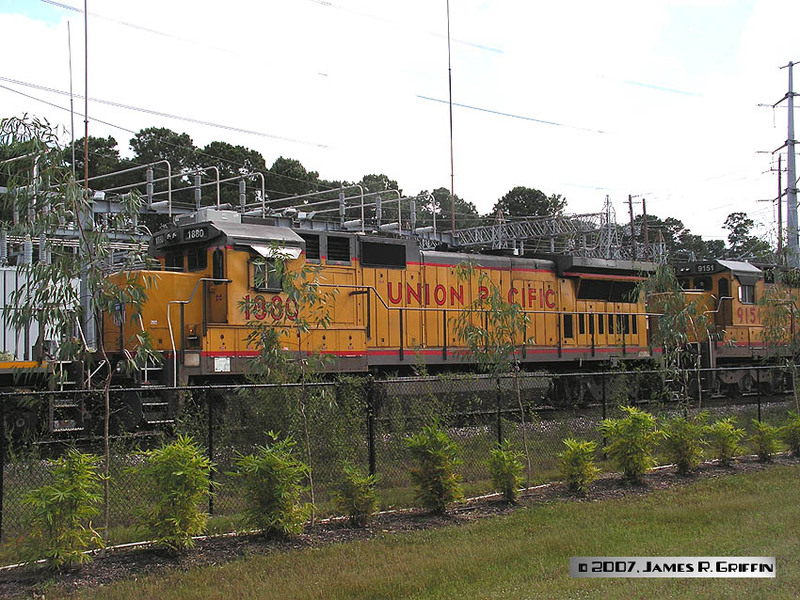 9151 in Houston on 10/17/2007. This unit arrived new on the UP in January 1988. These are standard-cab DC units. Below: Close-up of the cab, conductor’s side. C41-8 No. 9078, originally C&NW No.8566, delivered September 1991, repainted to the UP scheme and number in 1999. 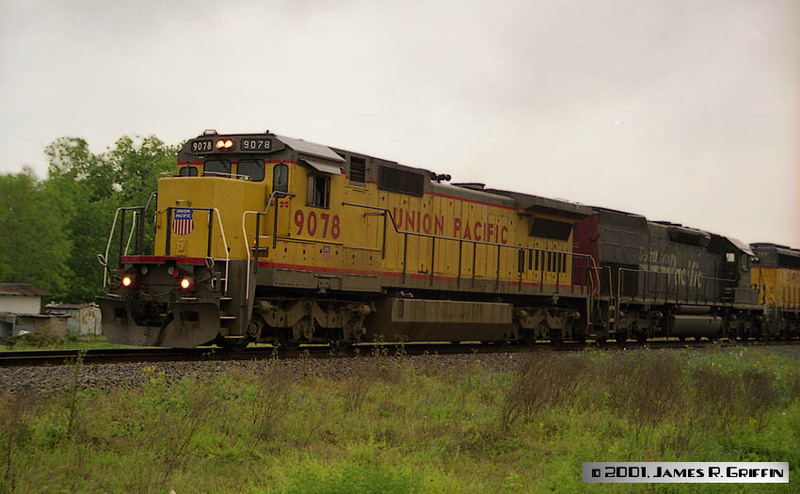 It’s viewed at Brownwood, TX in March 2001, on the point of a light movement. Directly behind is SP No. 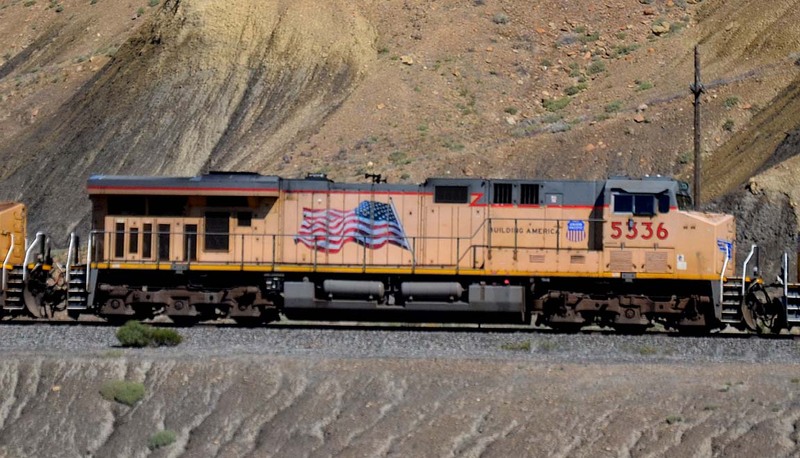 5352, nee D&RGW 5352, an SD40T-2 “tunnel motor”. C44-9W No. 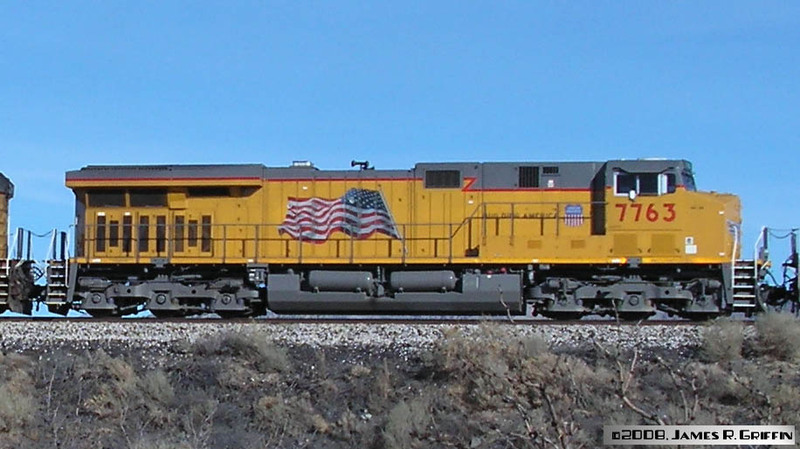 9718, leading an eastbound autorack train near Carrizozo, NM on 2/18/2008. This DC-traction unit arrived from GE in July 1994. 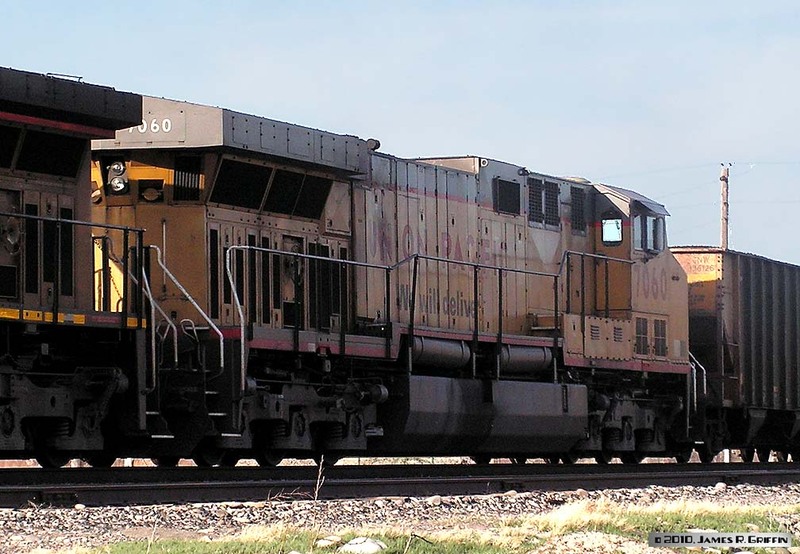 GE refers to this model as a Dash 9-44CW. 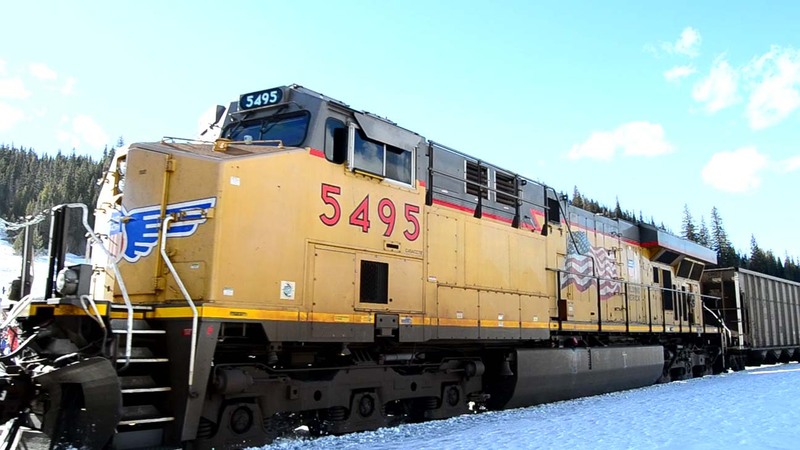 The AC4400 (or C44AC) was GE’s initial entrant into the AC-traction market, and has proven extremely successful. Debuting in 1995, it has evolved into several different versions over time, adding power-management and emissions features to increase its flexibility and be more environmentally friendly and effecient.One of the subsequent types is the C44AC-CTE. The CTE designation means “Controlled Tractive Effort”. Effectively, these units can have their power-on-rail reduced to prevent mishaps with lighter trains or when operating as DPU helpers. The C45AC-CTE is a more recent version of the same general idea, but meets the Tier II emissions requirements (the 45 in UP’s parlance does not refer to its horsepower). C44AC-CTE No. 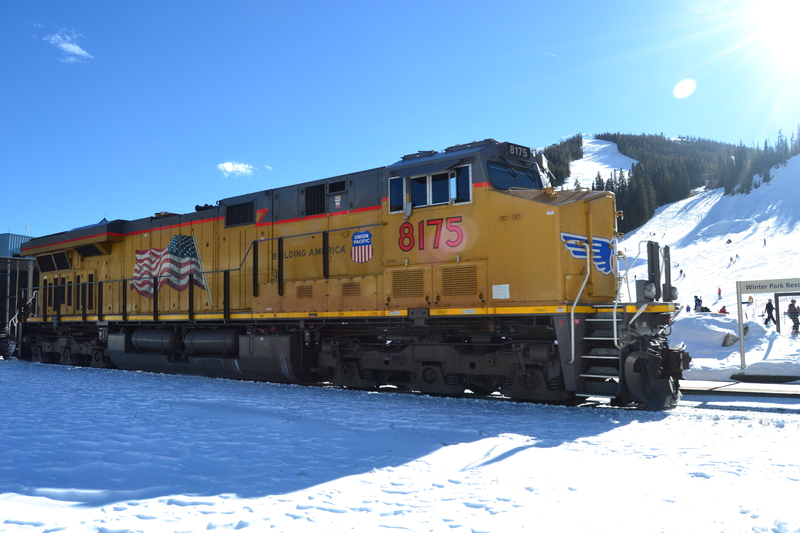 5678, parked in Denver on 12/16/2014. Built November 2004 and delivered the following month. C44AC-CTE No. 5717 is shown leading the MDVRO on 12/06/2008. My apologies for cutting off both ends in the photo. Many interesting details show up in this close-up, in particular the later CTE-style AC cabinet behind the cab. Note the three lower X-brake panels and four upper panels. For comparison, see this photo which demonstrates the original AC4400 door design. 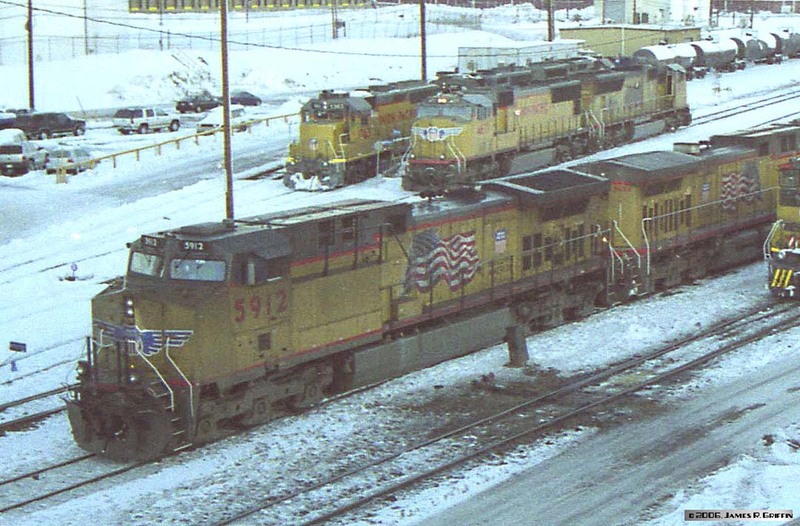 This photo of 5717 also illustrates the grimy state of locomotives working on the tunnel district during the wintertime. 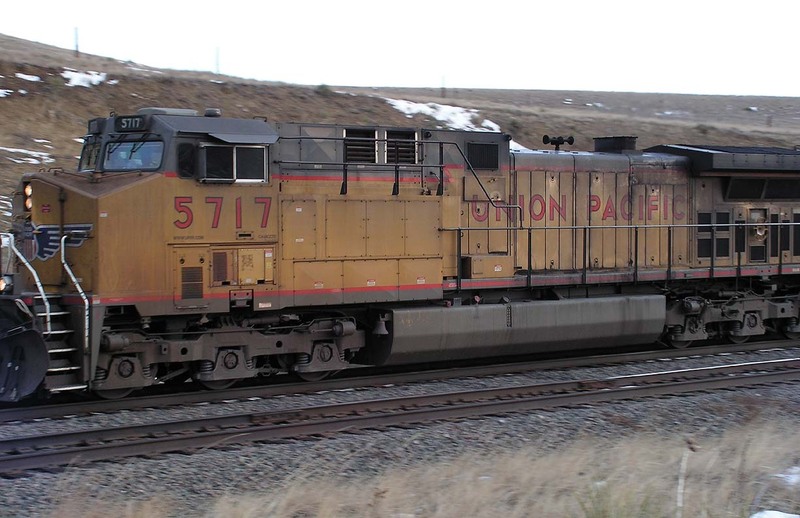 C44AC-CTE No.5764 is the trailing unit on an eastbound coal empty passing through Delta, CO on 4/16/2010. It was delivered in March 2001. C44AC-CTE No. 5802 has just arrived at Brendel, UT to be dropped off for use by the DOE hazmat cleanup project at Moab. 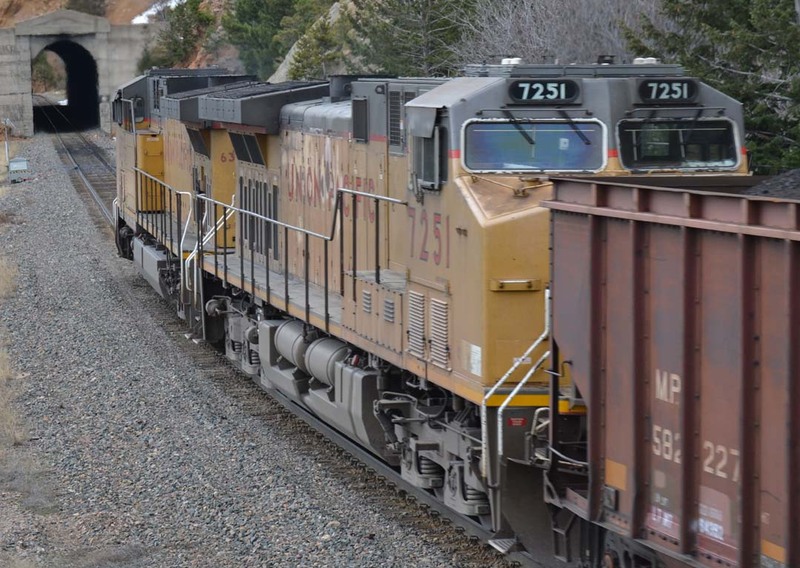 I chased this unit as it led the Potash Turn west from Grand Junction, with 6 units and 1 freight car. Very odd-looking train! C44AC-CTE No. 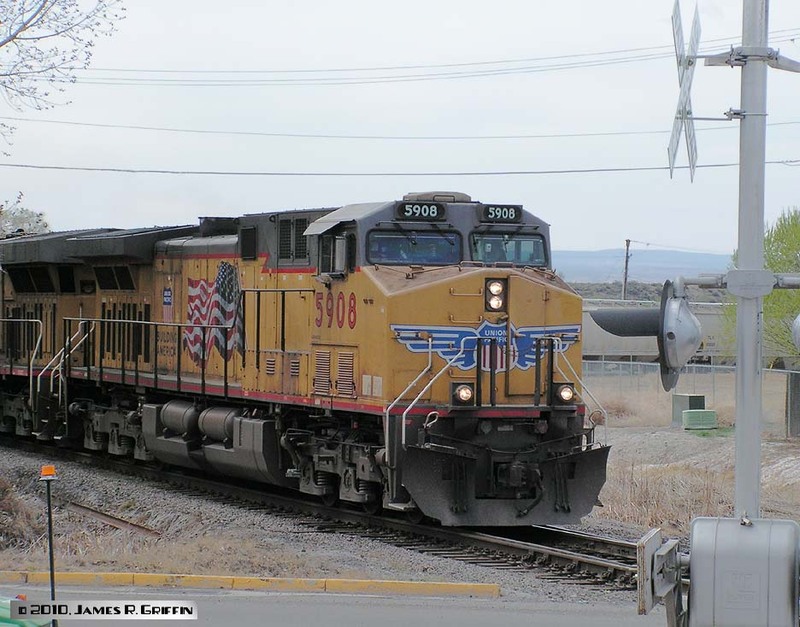 5902 pauses to embark a road crew at Grand Junction on 4/28/2014. Built December 2002 and delivered the following month to UP. 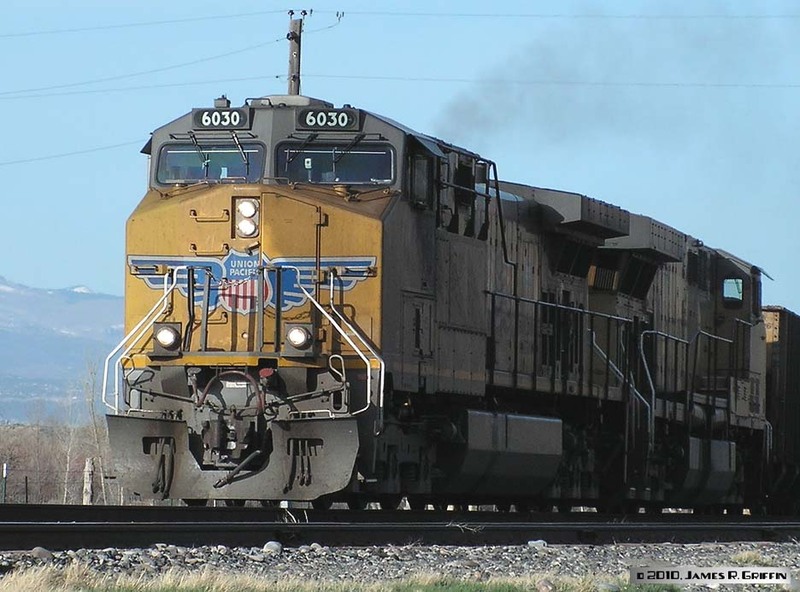 C44AC-CTE No.5908 is the lead unit of an an eastbound coal empty passing through Delta, CO on 4/16/2010. C44AC-CTE No. 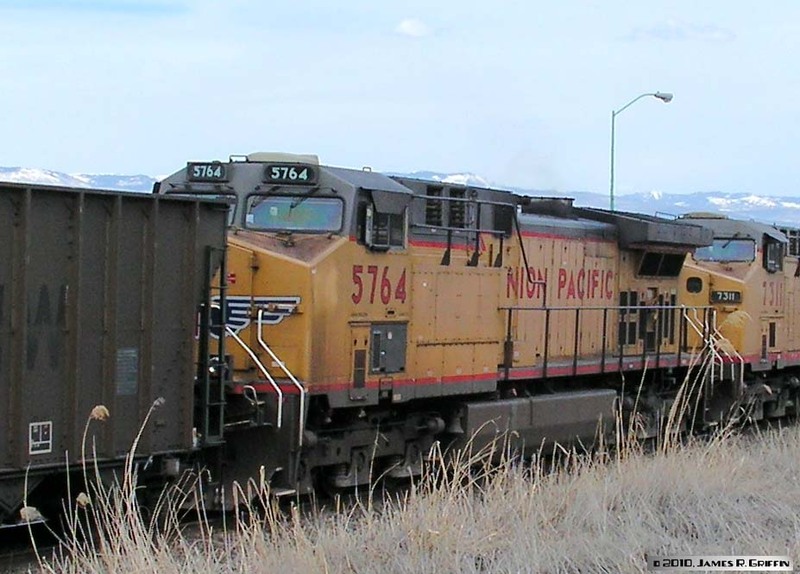 5977 is eastbound at Escalante, CO on 4/15/2010. C44AC-CTE No. 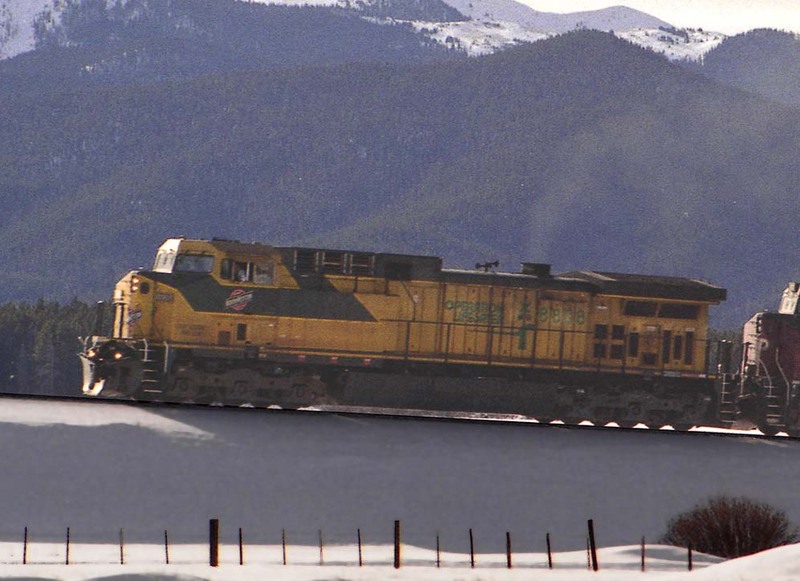 6030 leads a westbound load at Roubideau, CO (near Delta) on 4/15/2010. C44AC-CTE No. 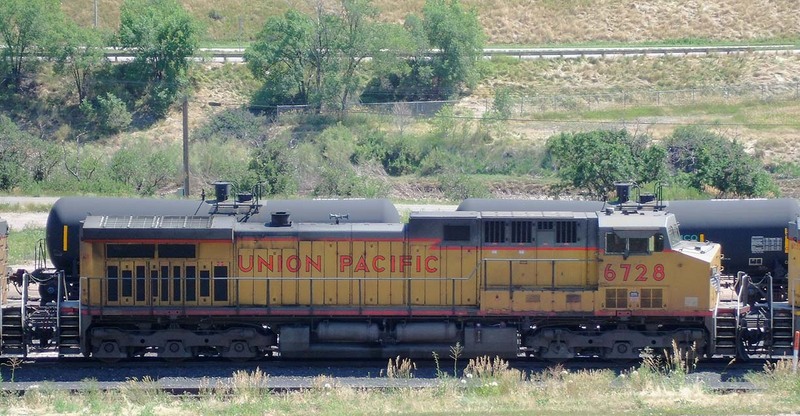 6052, seen at Glenwood Springs on 7/29/2011. Built December 2003 but not delivered until April 2004. C44AC No. 6170 was delivered as SP AC4400 No. 353 in May 1995. 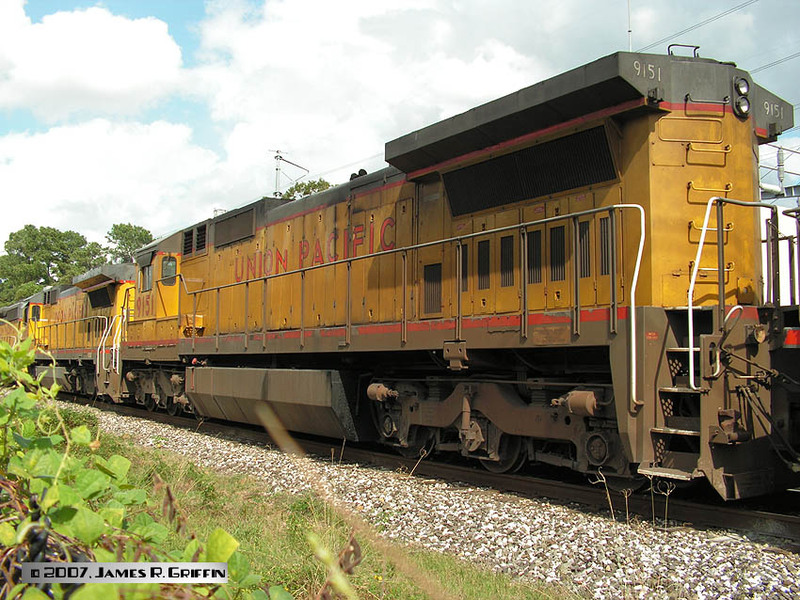 Here it’s running third on a westbound manifest train at Rocky, on 12/06/2008. C44AC No. 6204 was originally SP AC4400 No. 157. Many Espee AC4400’s were initially just patched, but this one is a full repaint. The main difference between these units and their “standard” UP sisters is that the cab is not acoustically isolated. This particular one is also from the SP series that did not include master DPU controls. AC4400 No. 6216, the renumbered SP No. 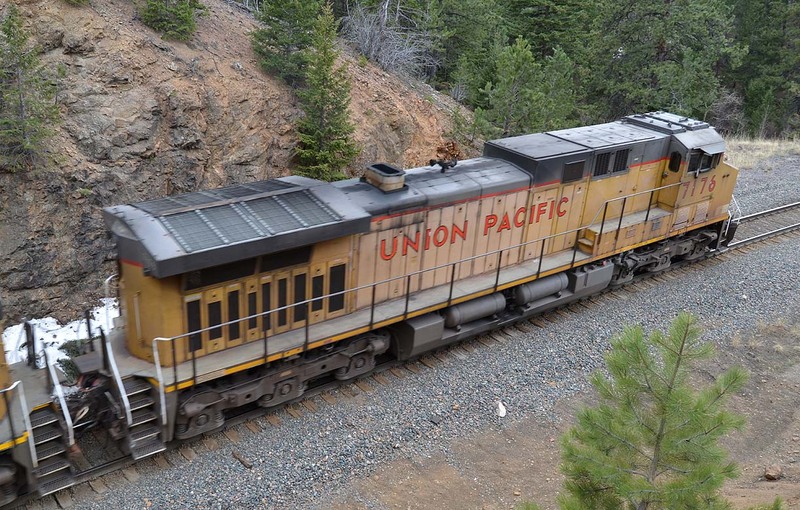 303, is part of a 3-unit swing DPU east of tunnel 21 on 4/12/2014. This unit was one of the earliest AC4400’s built yet is still working hard 19 years later. Built July 1995 in SP’s second batch. AC4400 No. 6233 on an eastbound coal load at West Portal on 2/18/2018. Originally SP 189, renumbered March 2004, though I guess it was only a patch at that time (this paint looks far too fresh). Delivered May 1995, and lacks DPU controls. AC4400 No. 6337 leads an eastbound coal load down through the tunnel district on 4/12/2014. Here it’s just exiting tunnel 21. Note the non-standard nose art. Built July 1995 as SP No. 292 and repainted/renumbered in September 2003. AC4400 No. 6357 is the trailing unit on a westbound coal empty, having just exited Tunnel 19 on the Moffat line (4/12/2014). Built July 1995 as SP No. 304 and repainted/renumbered in June 2003. C44AC No. 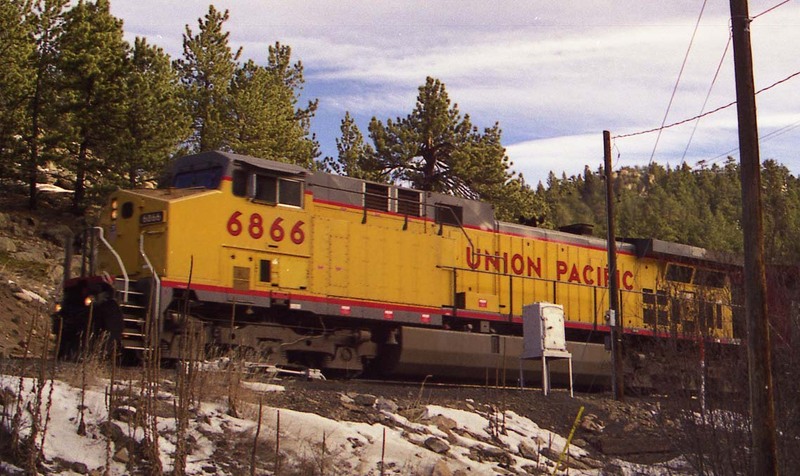 6496 was delivered in June 2000, part of an order of 120 units from that year. Here it’s in the helper pool at Glenwood Springs, CO on 9/01/2008. C44AC No. 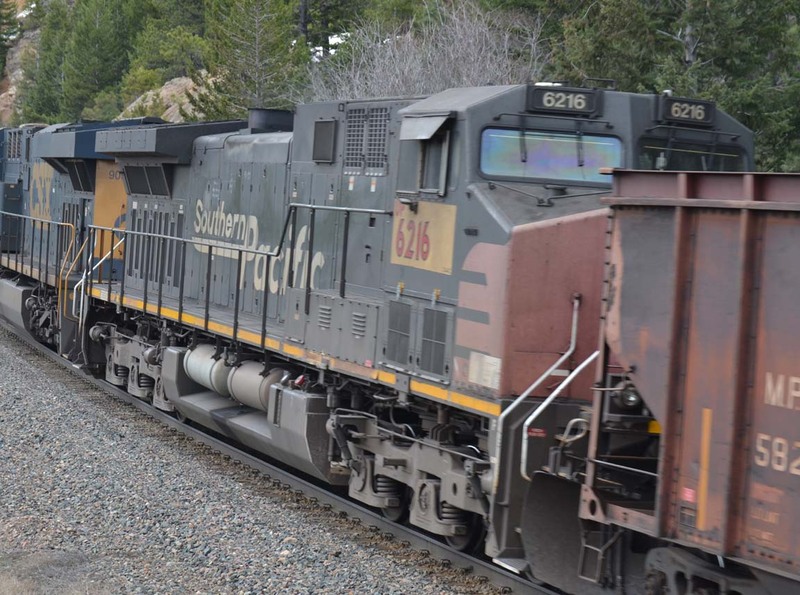 6573 is seen at Glenwood Springs on 9/01/2008. Built in April 1997, this unit is only 11 years old here yet is starting to fade pretty bad. C44AC No. 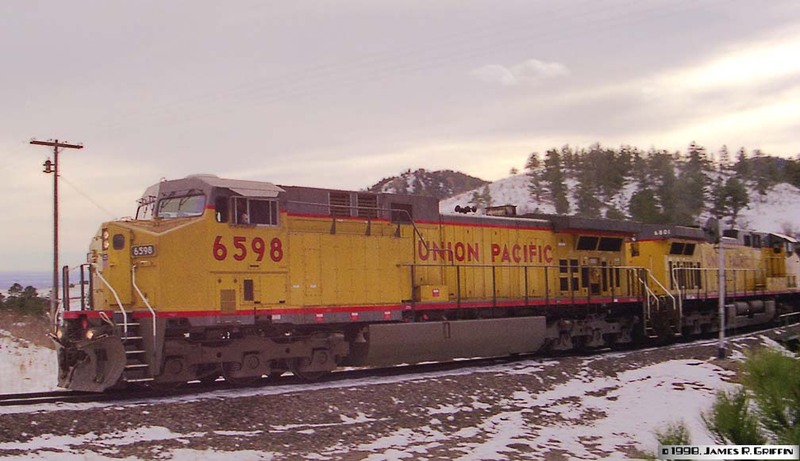 6598 leads an empty coal train at Coal Creek Canyon on 12/26/1998. Part of an order of 150 such units, it arrived in May 1997 and so is about a year and a half old in this photo. C44AC No. 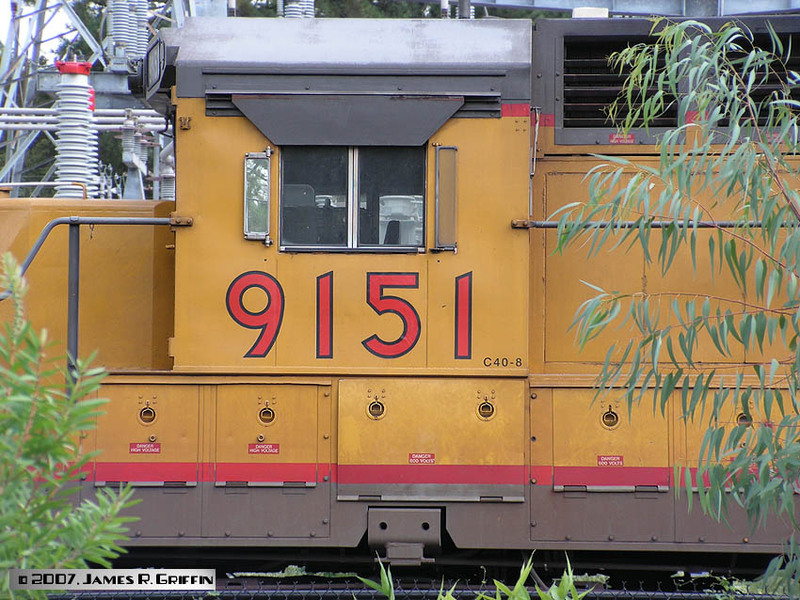 6605, on a mid-train remote helper set at West Portal on 2/18/2018. 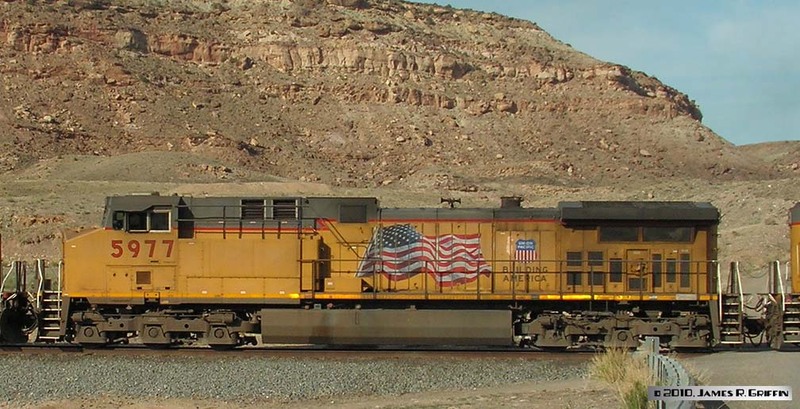 Delivered May 1997, and has since been repainted into the Flag scheme. C44AC No. 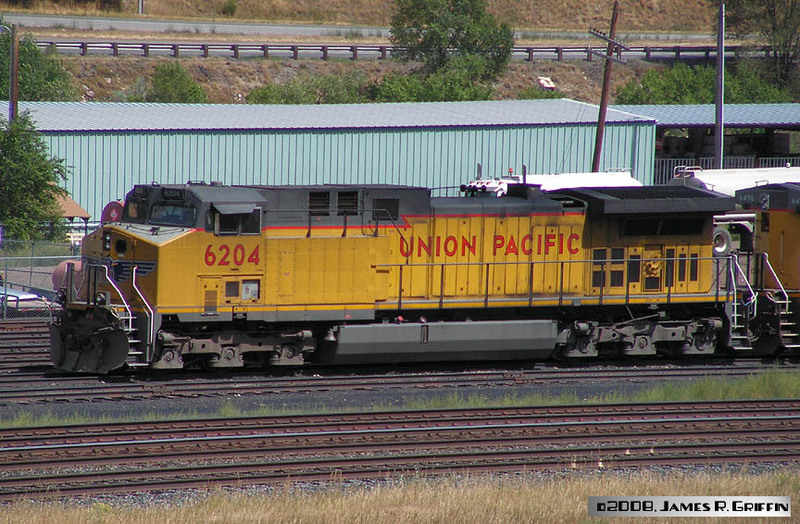 6673 is staged on the west end of a string of DPU units at Glenwood Springs, 7/29/2011.Delivered July 1997, and starting to fade quite a bit. C44AC No. 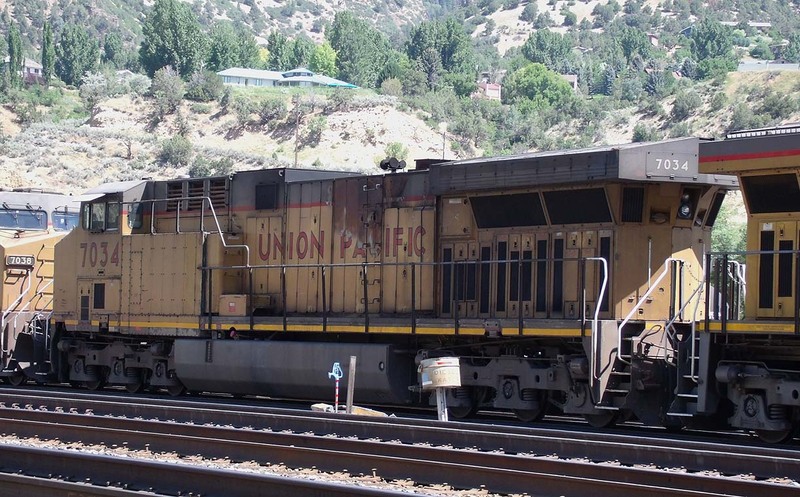 6728 is staged at Glenwood Springs, 7/29/2011. Originally C&NW 8826, delivered December 1994 and repainted/renumbered January 2003. Note the wings, lightning stripe, and the UP shield on the cab (but no flag). C44AC No. 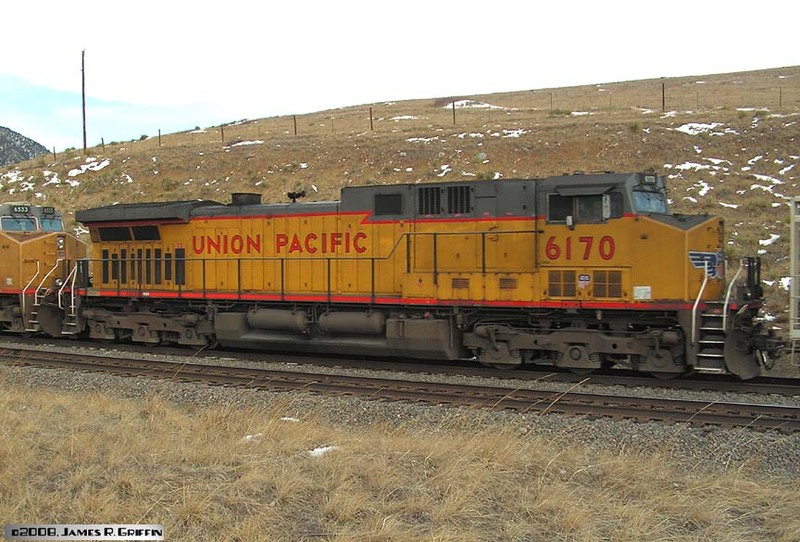 6749 is DPU on an eastbound North Fork coal load, preparing to depart Grand Junction on 4/28/2014. 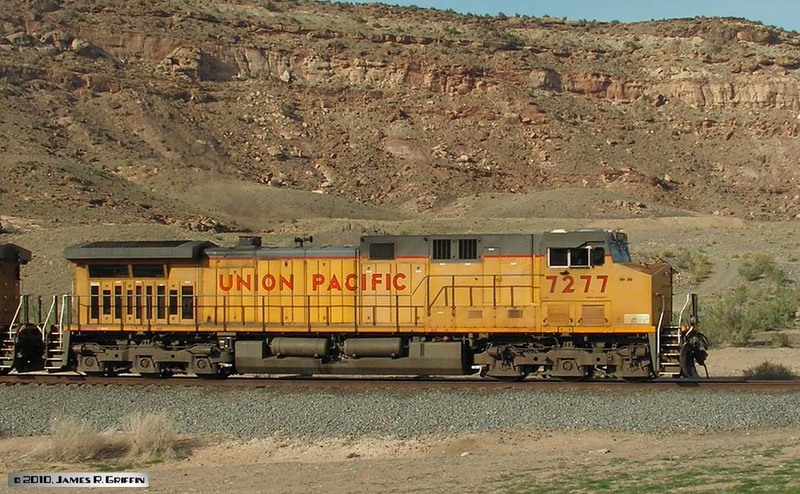 Built March 1996, one of the older C44 series units on UP’s roster. Chicago & North Western (C&NW) AC4400 No. 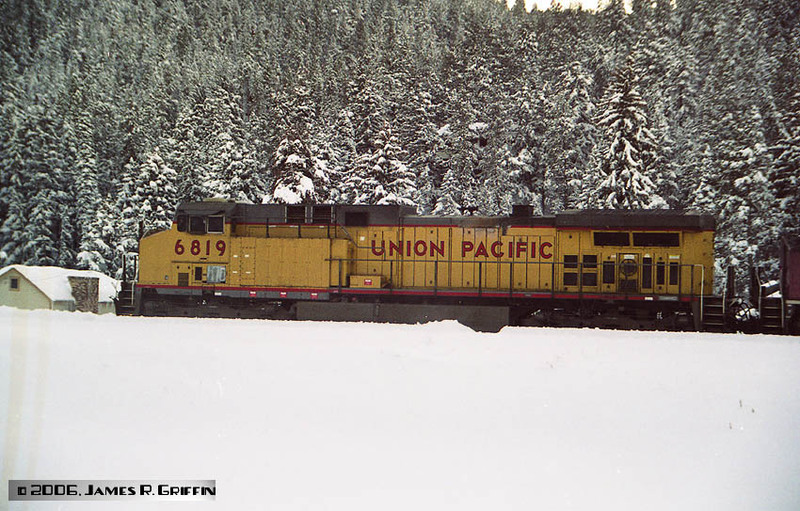 8808 leads a coal load at Fraser on 12/28/2000. It’s in the Operation Lifesaver scheme. 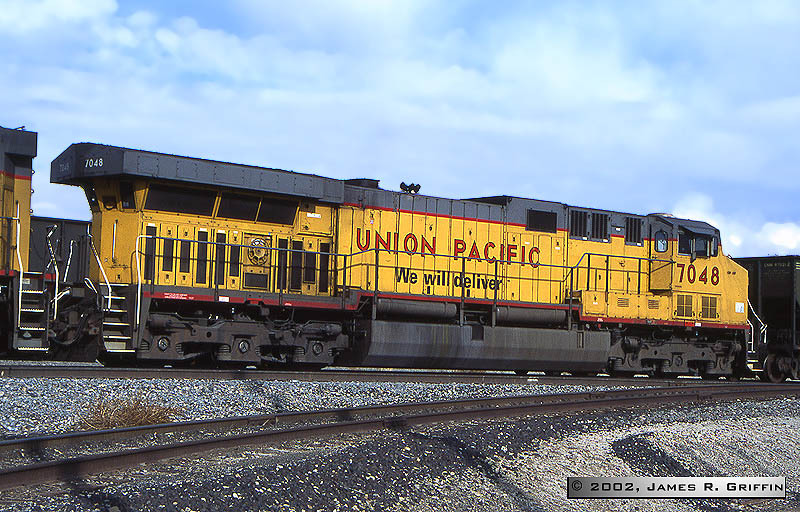 Built November 1994 (the oldest AC4400 I have photographed), it was later renumbered to UP 6710 in October 2003. C44AC No. 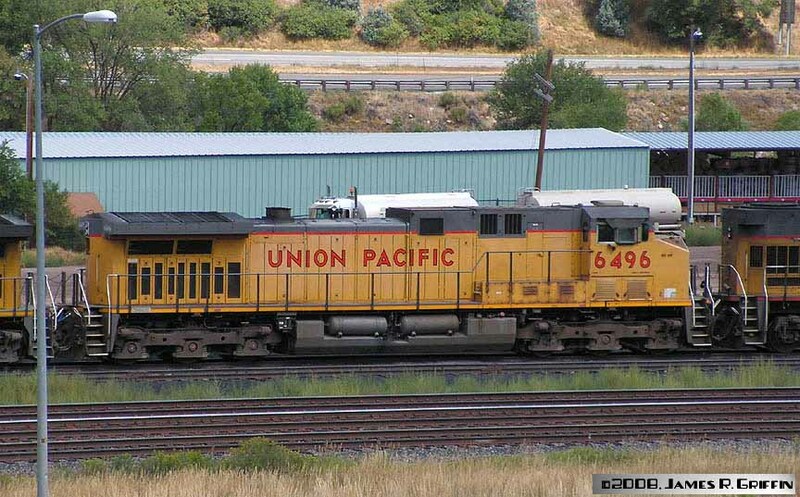 6813, running second on a freight at Granby, CO on 8/9/2007. It was part of an order of 150 units that was delivered throughout 1996, making it one of the older groups of C44AC’s on the roster. C44AC No. 6819 is on the point of an eastbound coal train, in Pinecliffe siding on 12/30/2006. 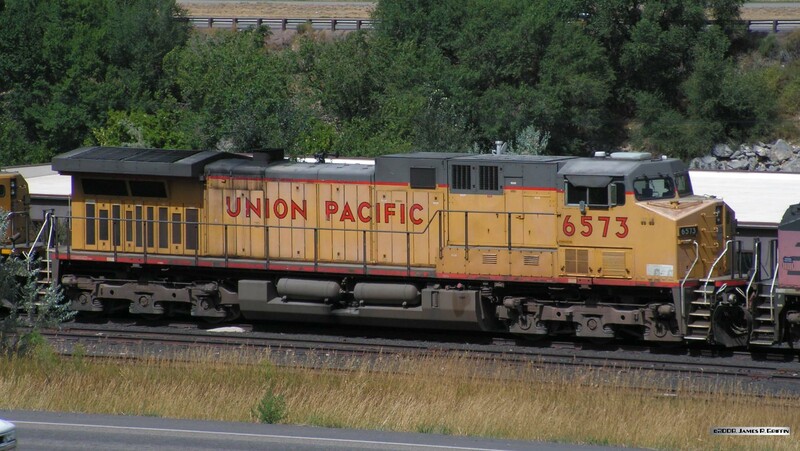 These units have been ubiquitous on coal trains since their arrival. This unit came in June 1996 along with No. 6813 above. C44AC No. 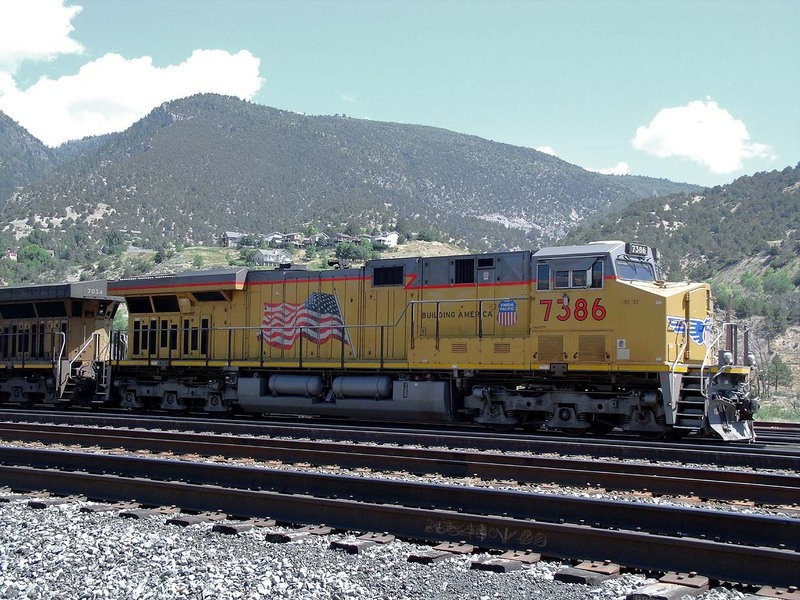 6887 waits at Glenwood Springs, 7/29/2011. C44AC No. 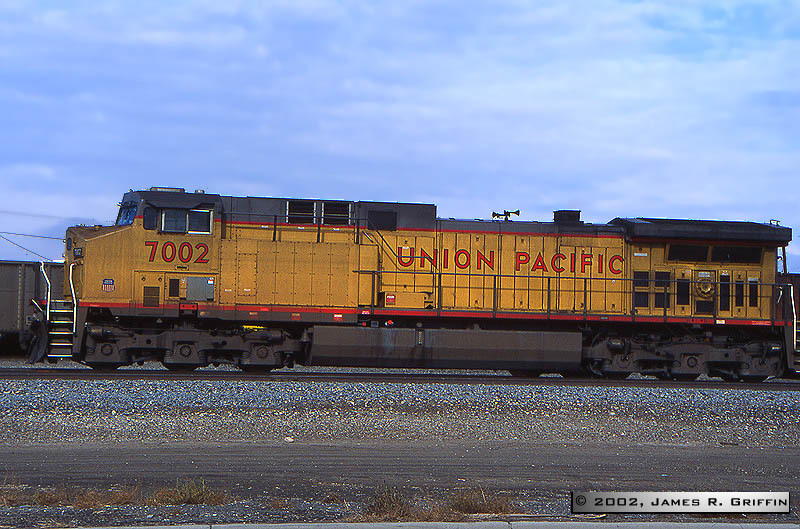 7002, at Grand Junction in November 2002. It was originally leased from GECX as No. 4002 in March 1997, and was repainted in UP colors in 1999. C44AC No. 7124, mid-train at Pinecliffe, CO on the day after Christmas 1998. Built July 1998, it is less than 6 months old in this photo. 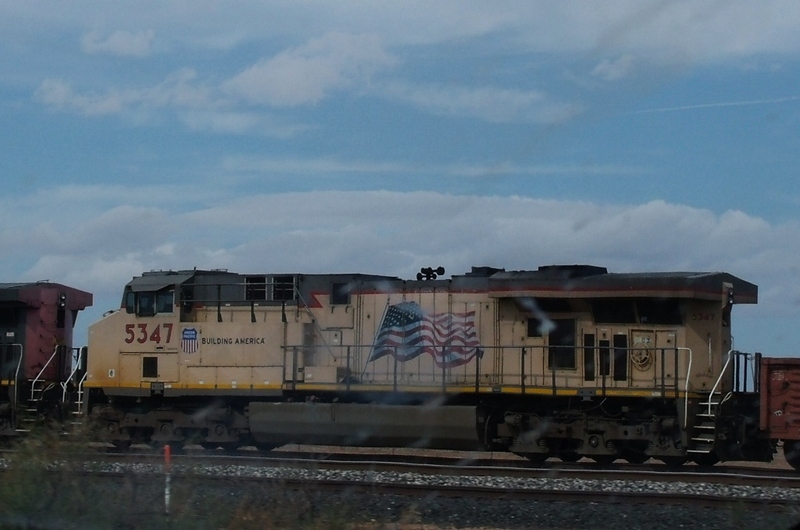 TOP: Leading an eastbound windmill train at Bowie, Arizona (on the Sunset Route) on 10/14/2013. Delivered July 1998, it’s over 15 years old in this photo. 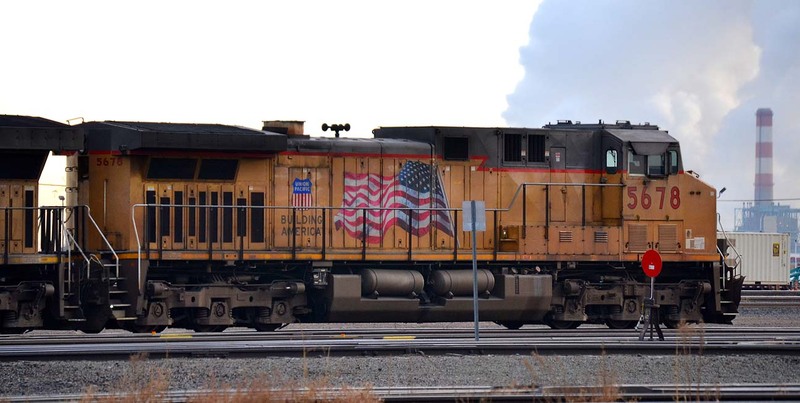 Contrast the faded paint to the relatively new SD70ACe to its left.BOTTOM: parked in Denver’s North Yard on 12/16/2014. C44AC No. 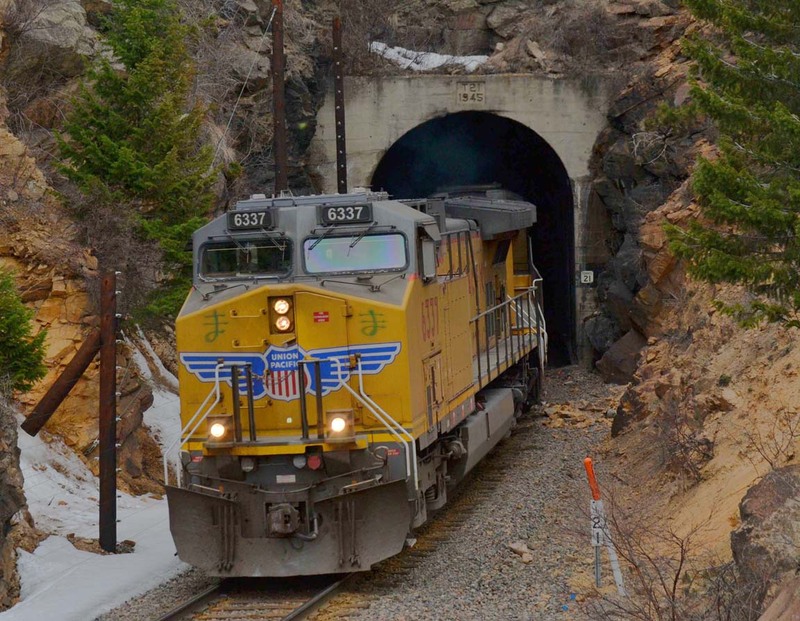 7176 is lead unit on a set of empty aluminum hoppers, westbound out of tunnel 19 on the Moffat (4/12/2014). 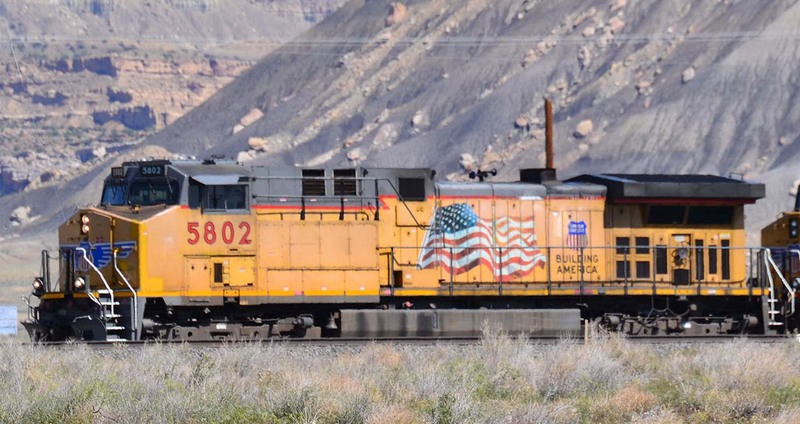 Note the Positive Train Control antenna array on the cab. C44AC No. 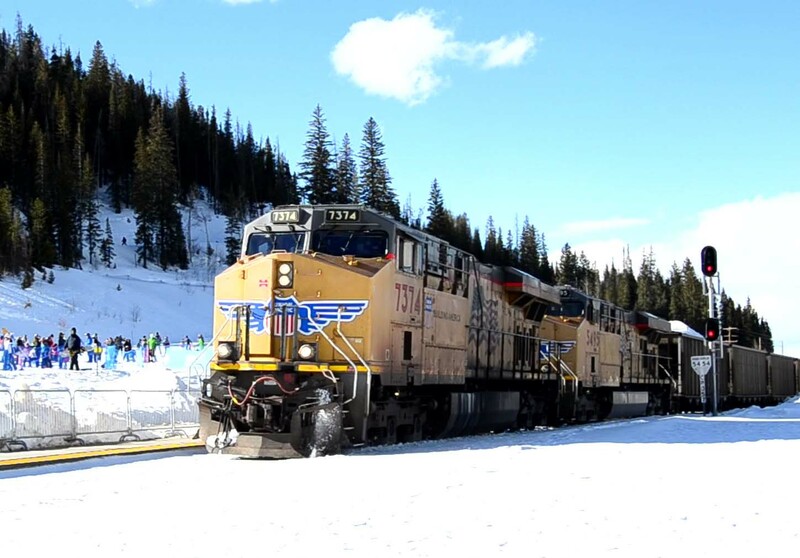 7251 is the trailing unit on an eastbound coal load between tunnels 21 and 20 on the Moffat (west of Denver)– 4/12/2014. C44AC No. 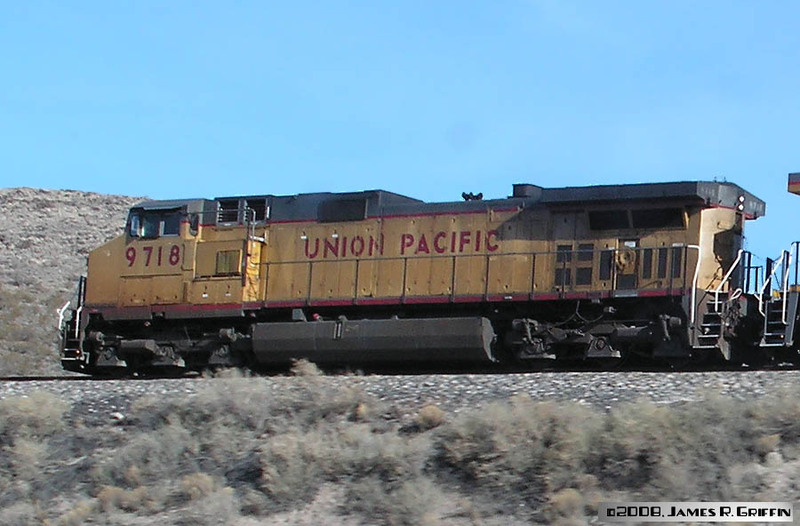 7268 is rolling dead-in-consist across Thompson Hill, Utah on 4/27/14 on its way to Brendel. C44AC No. 7277 leads an eastbound empty on the North Fork sub on 4/15/2010. Here it’s seen at Escalante. 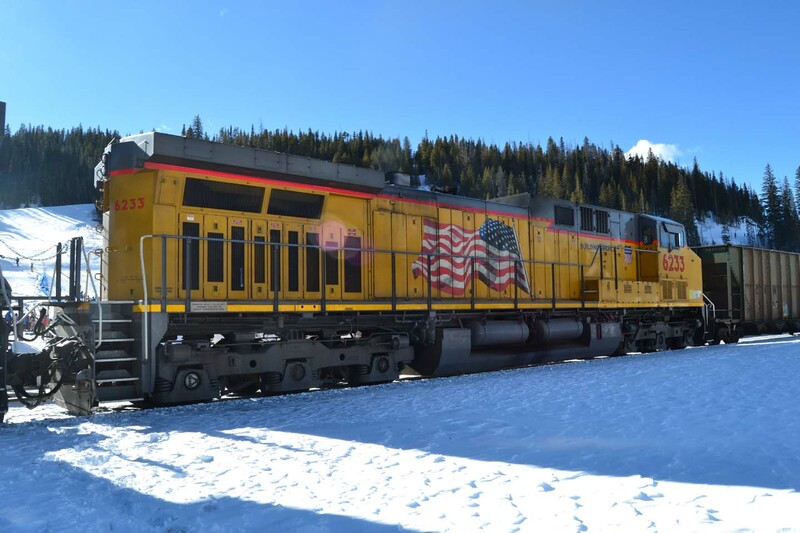 GE’s AC6044CW model was analogous to EMD’s SD9043: it is a C60 carbody with a 4,400-hp prime mover installed, convertible to a 6,000-hp motor if desired later. UP’s designation is both C44/60AC and C6044AC. C6044AC No. 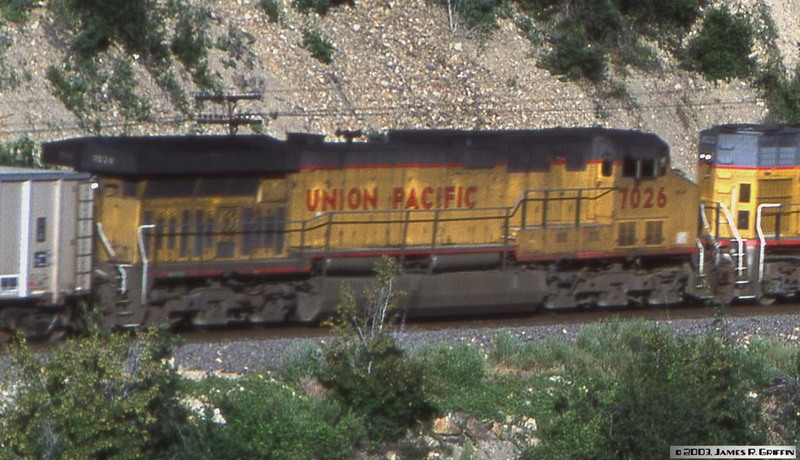 7026 is the trailing unit on a westbound coal empty in Glenwood Canyon, June 2003. Judging by the coat of grime, this one has been working hard. In UP’s number-juggling system, this unit became 7352 in May 2005, then 7046 on Jan 13, 2009. C6044AC No. 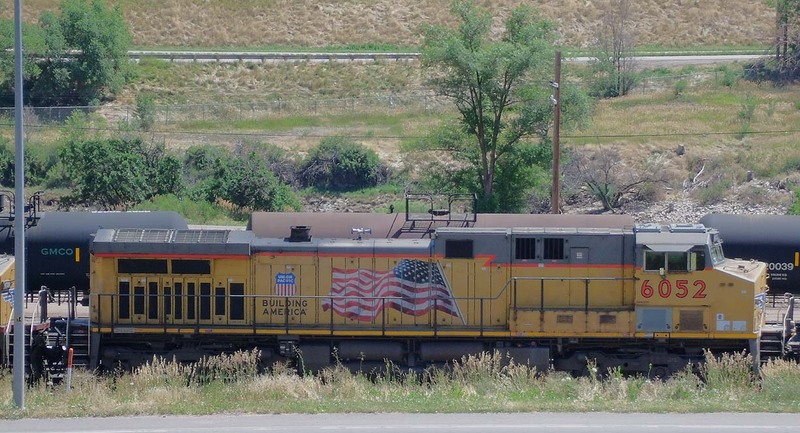 7034 is staged in Glenwood Springs yard on 7/29/2011.Delivered January 1996. This unit was not renumbered with other C60/44’s; it has kept the same number since delivery. C6044AC No. 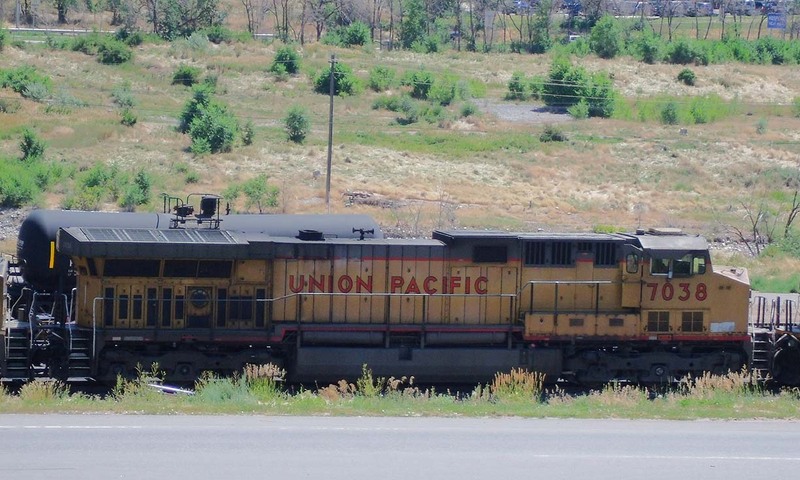 7038 is staged in Glenwood Springs yard on 7/29/2011. Delivered December 1995. This unit was not renumbered with other C60/44’s. C6044AC No. 7041, at West Portal on 2/18/2018. One of the convertible units that was never converted to 6000 hp. C6044AC No. 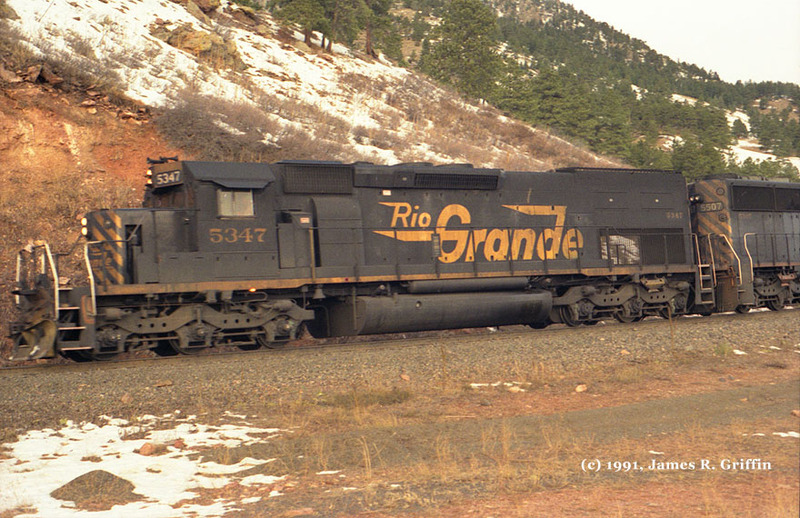 7048, Grand Junction, November 2002. This unit built December 1995 and painted with the then-current UP slogan, was renumbered 7374 in March 2004, then to 7321 in September 2008. Note the radiator which extends beyond the long hood, the distinctive feature of this model. C6044AC No. 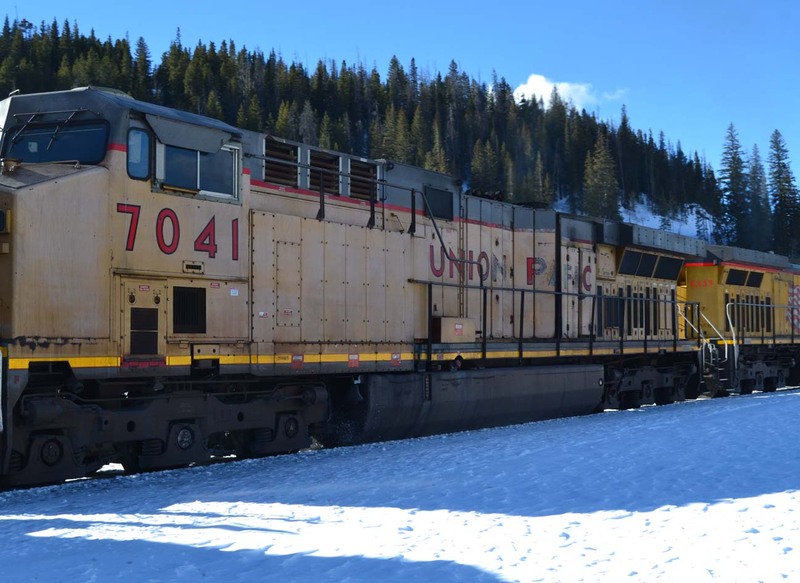 7060 is running second on a westbound load at Roubideau, CO on 4/15/2010. Delivered September 1996, the same month as the merger with SP. This unit retained its original number, unlike many of its sisters. C6044AC No. 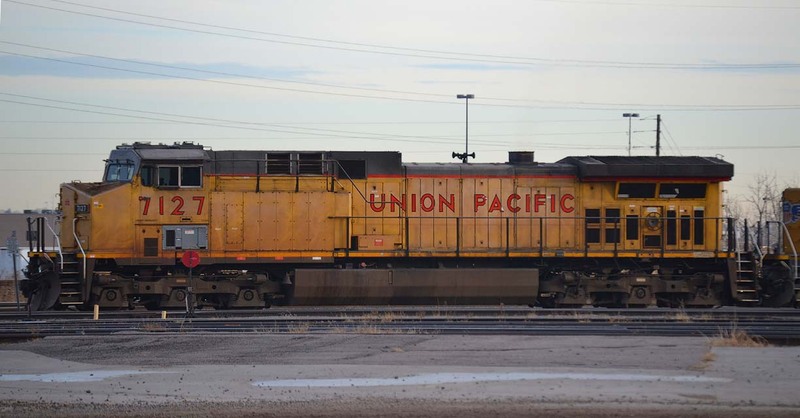 7302 is parked in Denver’s North Yard (by the Cargill elevator) on 12/16/2014. C6044AC No. 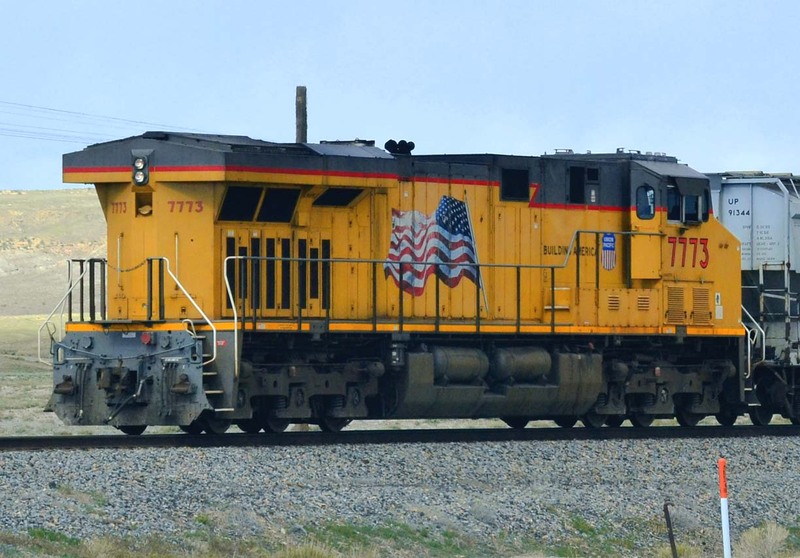 7311 is seen passing through Delta, CO on 4/16/2010. This convertible unit was built in March 1998. C6044AC No. 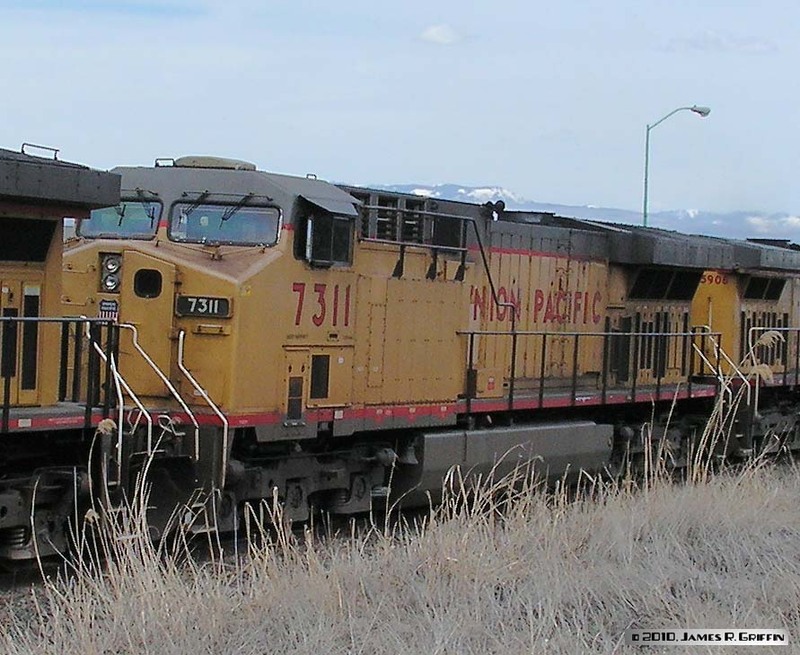 7318, rumbling east through Escalante, CO on 4/15/2010. The GEVO ES44AC series (C44ACCTE and C45ACCTE in UP parlance) replaces the AC4400 in GE’s model range. See Wikipedia for a full GEVO discussion. Built July 2006 and delivered the following month. C45AC-CTE No. 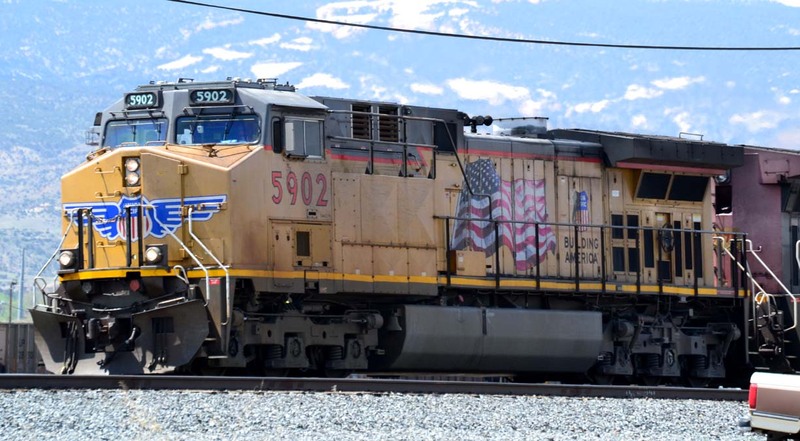 5383, seen at Brendel, UT on 4/27/2014. It and three other GE’s have just been dropped off for use by the DOE’s cleanup effort at Moab. Built February 2005 and delivered the following month. C45AC-CTE No. 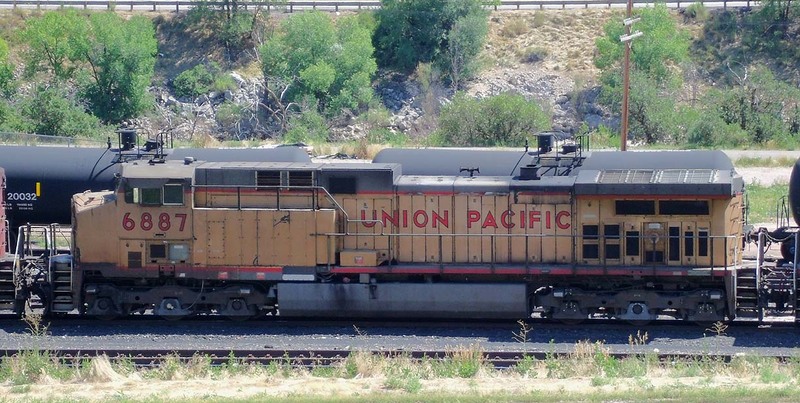 5495 (ES44AC), running second on an eastbound coal train at West Portal. C45AC-CTE No. 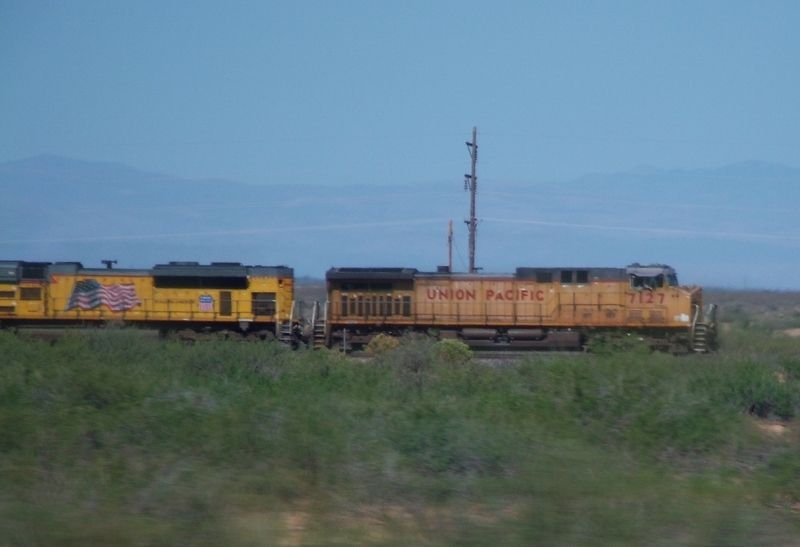 7370 leads an eastbound train on the Sunset, between Deming and Las Cruces. C45AC-CTE No. 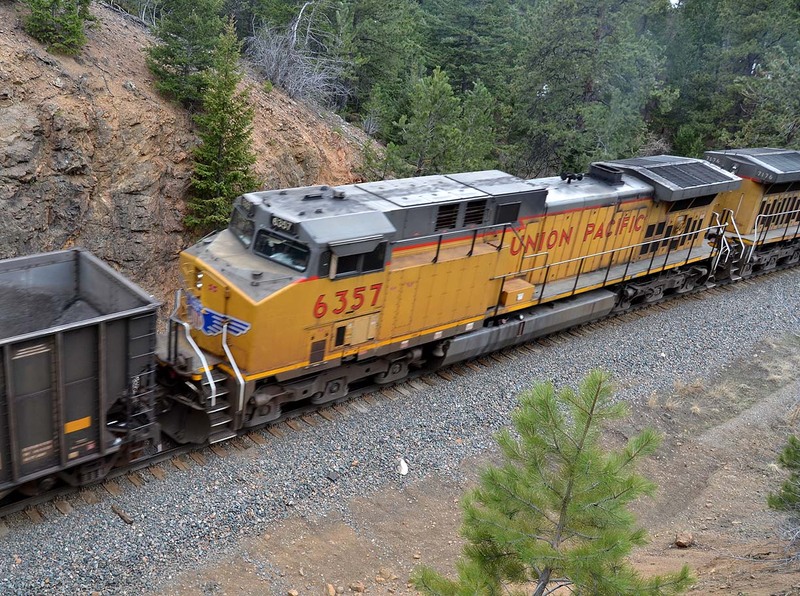 7374 is on the point of an eastbound coal load, which has just topped the grade leading up to Moffat Tunnel and is preparing to curve into the 6.2-mile bore. Note that the plow is starting to throw up a tiny spout of snow. It had drifted a bit through here during the day. C45AC-CTE No. 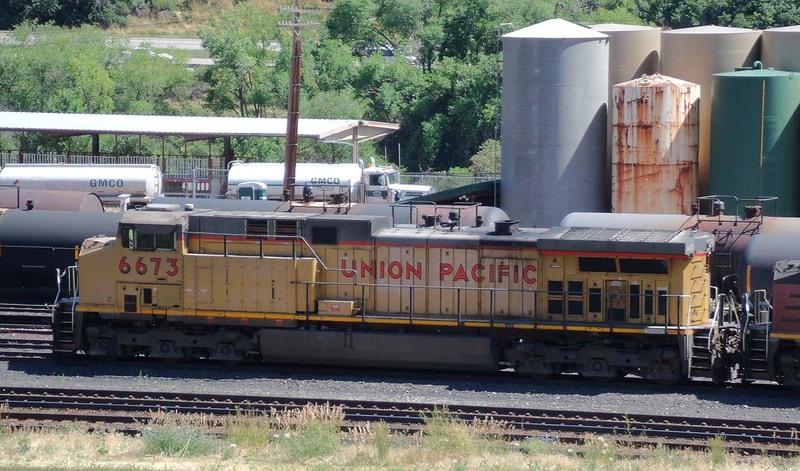 7386 is staged in Glenwood Springs yard on 7/29/2011. UP keeps helper (DPU) units here during the warmer months when the engines can be shut down.Built March 2009. C45AC-CTE No. 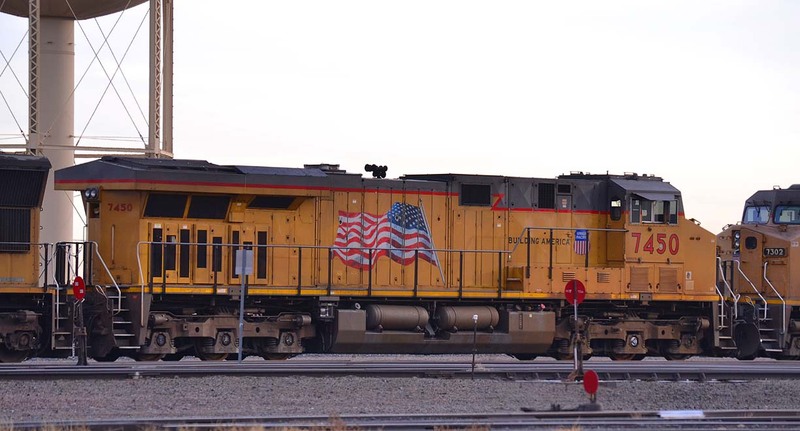 7450 is parked in Denver’s North Yard on 12/16/2014. C45AC-CTE No. 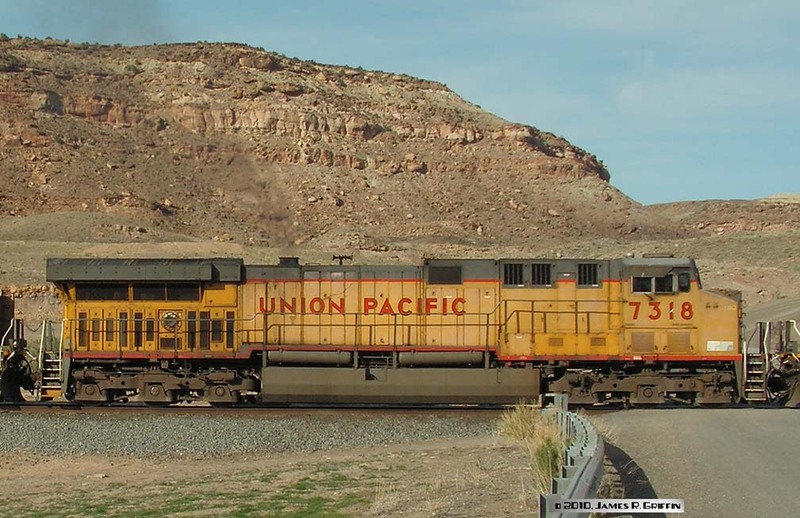 7729 leads an MROGJ freight downhill towards Cisco, UT and the Colorado River valley on 4/27/2014. 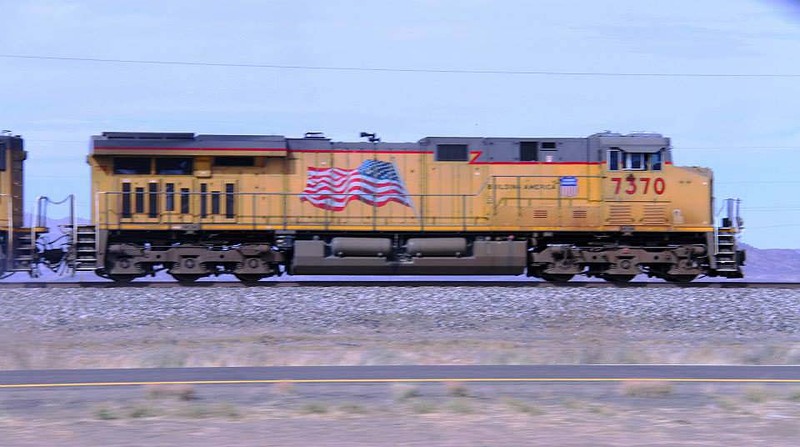 Note the heat shimmers from the dynamics and exhaust– even though the train is going about 40 MPH, the tailwind is keeping up. C45AC-CTE No. 7763. 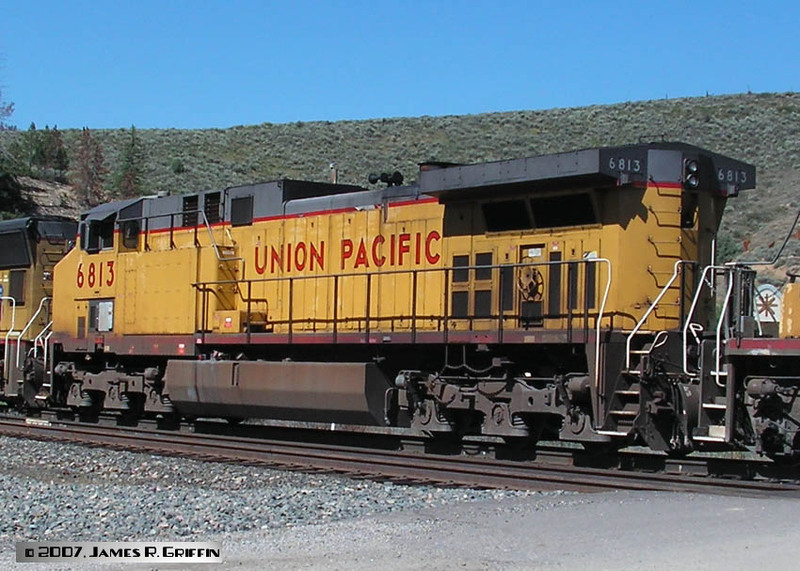 This unit arrived on 9/18/2007, and was exactly five months old when this shot was taken near Carrizozo on 2/18/2008. Notice the variant on the paint scheme: there is a yellow stripe on the lower portion of the radiator wing. C45AC-CTE No. 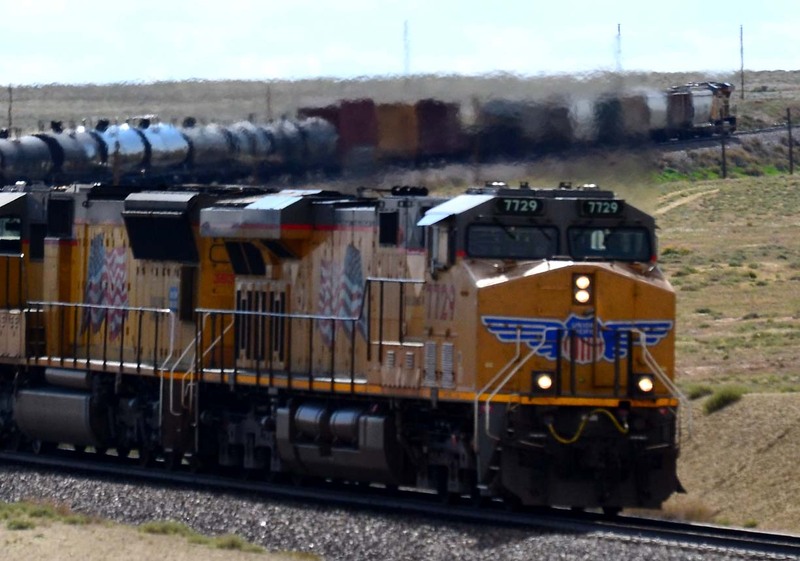 7773 is a trailing remote on the MROGJ freight on 4/27/2014, drifting through Cisco, UT. Cisco, incidentally, is an interesting place– a true ghost town.Built September 2007. C45AH No. 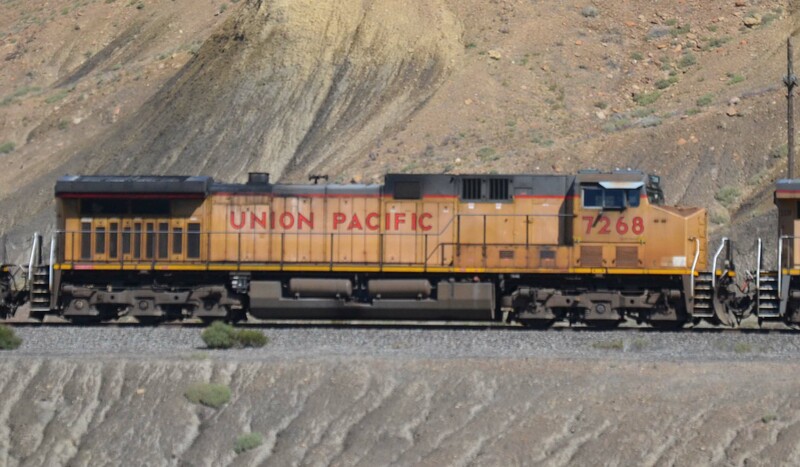 8175 is actually the trailing remote unit on an eastbound coal train at West Portal. Most of the train is already into the tunnel at this point. C45AH No. 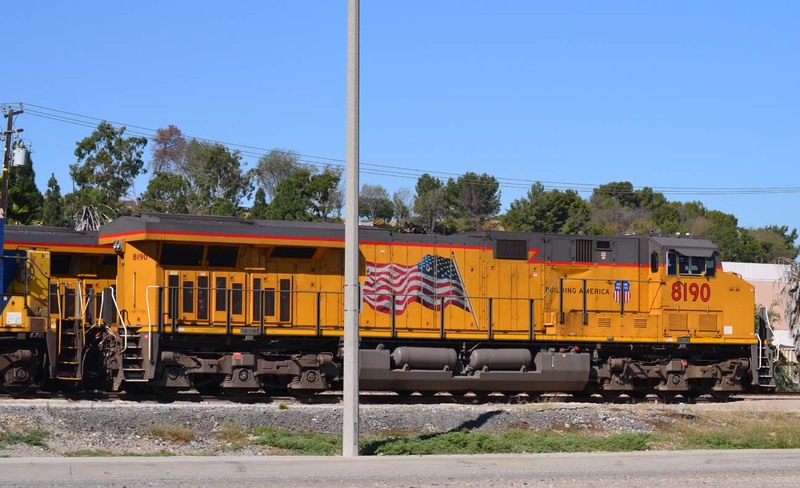 8190 at Los Angeles on 10/30/2015. 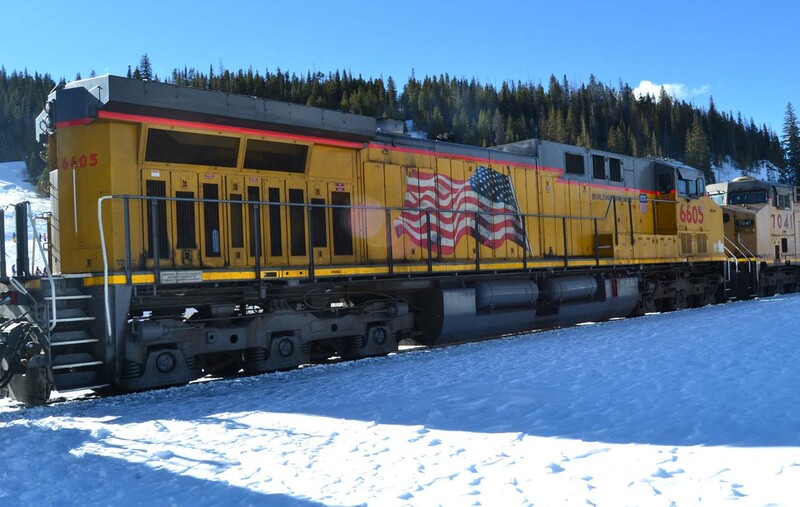 The “AH” designation indicates an AC unit but heavier and with software upgrades and other equipment enhancements to produce higher tractive effort at greater efficiency. See Wikipedia for more info.